Air Explorer - Access all your cloud servers using just one program. 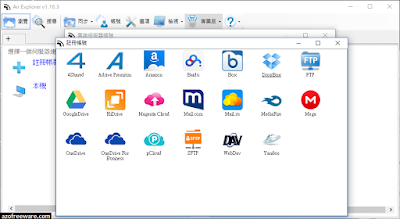 Air Explorer supports the best cloud servers: OneDrive, Google Drive, Box, Dropbox, Mega, Copy, Mediafire, Yandex, Baidu, WebDAV. - Direct management of your files in the cloud. - Multiply your storage space by joining all your clouds. - Cloud file explorer easy to use. - Plugins system to add cloud servers.